Vulcan Engineering recently shipped several Fox® Model 420 Stand Grinders with Super Abrasive (SA) wheels designed for SNAG grinding. The 20” SA wheel fits on a standard machine with no modification providing the user the capability to switch between bonded abrasive and SA wheels based on job requirements. For example, grinding iron casting with the SA wheel and grinding steel casting with the bonded abrasive wheel. 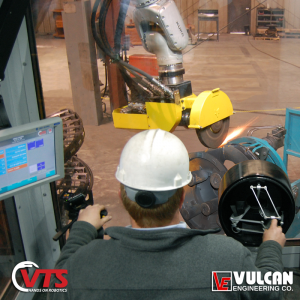 Vulcan has considerable experience in the integration and creation of unique solutions using robots for metal removal applications as well as highly efficient automated systems. 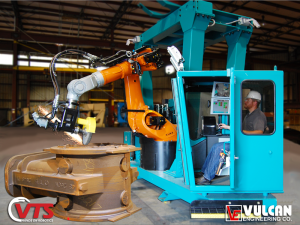 We engineer systems that use industrial robots to automate common tasks such as mold handling, mold pouring, casting finishing, and casting inspection. 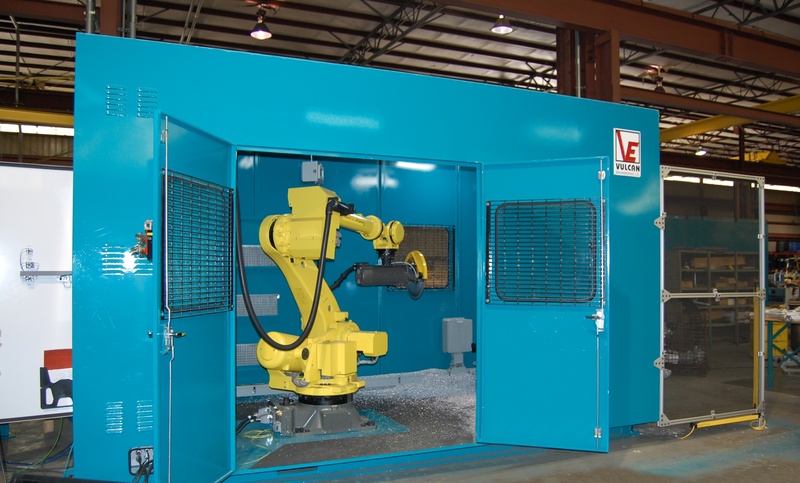 We recently completed a project that incorporated a Fanuc robot equipped with a carbide tipped saw to remove gating from aluminum automotive castings inside of an enclosed cell.